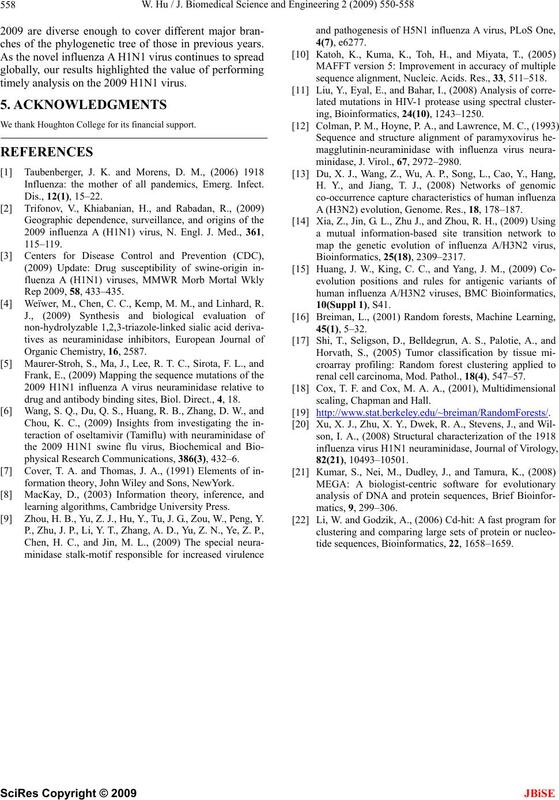 Received 13 October 2009; revised 27 October 2009; accepted 30 October 2009.
mans, birds, and a Eurasian swine influenza virus. in the past, in the 2009 H1N1 strains for the first time. performin g timely analysis o n th e 2009 H1N1 v irus. There are three types of flu viruses, types A, B, and C.
and supported by a long and thin stalk. swine influenza A virus strains from 1992 .
mutation of H1N1 swine flu. teractions of flu drugs with NA of the 2009 H1N1 virus. study were aligned with MAFFT . 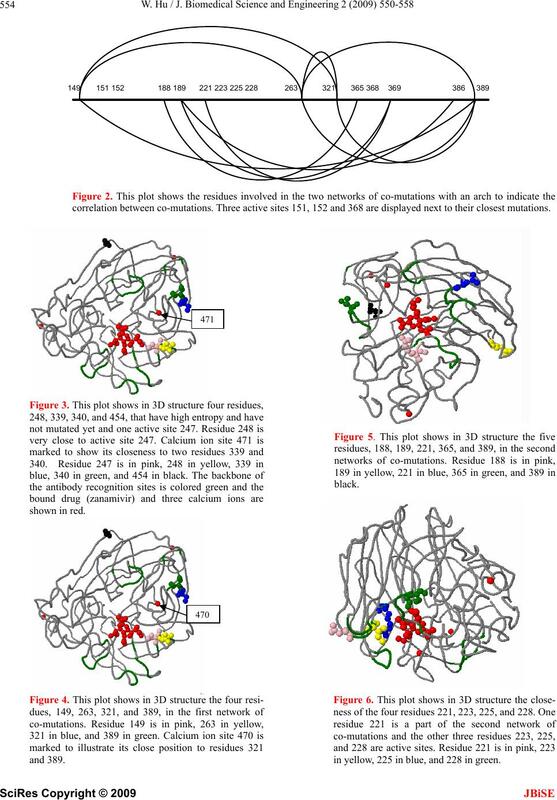 scribe H3N2 virus evolutionary patterns and dynamics. 370, 387–395, 431–435, and 448–468. 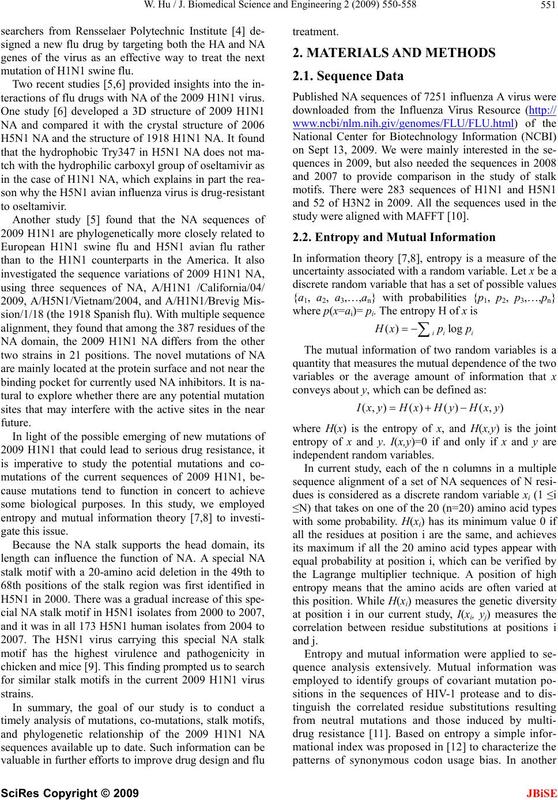 31 positions with high entropy are displayed in Figure 1. 286 and another near position 386 (Figure 1). illustrated by their entropy (Figure 1). may affect the drug binding sites from a greater distance. distant residues to the active sites. three-sequence alignment in , but it has high entropy. 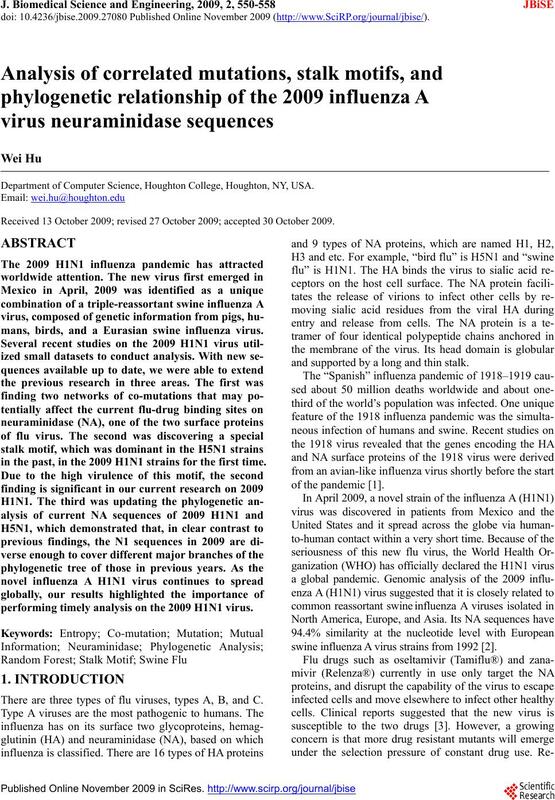 469) of H1N1 and H5N1 (2009) and H3N2 (2009) respectively. correlation between co-mutations. Three active sites 151, 152 and 368 are displayed next to their closest mutations. in yellow, 225 in blue, and 228 in green. ures 2, 5 and 6). in the different stalk motifs appearing this year. H1N1 in all three years. 2007 and 2008, but it was no longer the case in 2009. 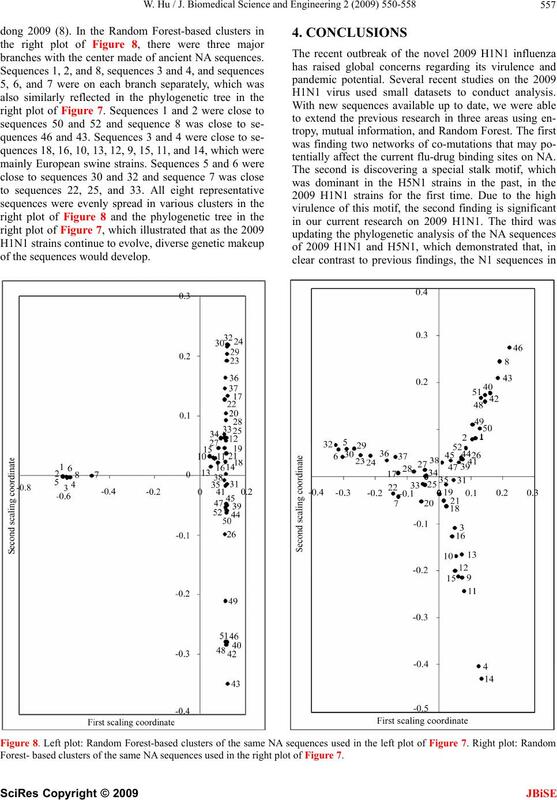 The new type 4 was more evident in H5N1 in 2009.
phylogenetic analysis conducted in the next section. 39 H1N1 W ei ss 43 g i|8 572187|g b|A A F 77 045. 39 H1N1 Weiss 43 gi|8572187|gb|AAF 77045.
tative sequences from 283 N1 sequences in 2009.
branches with the center made of ancient NA sequences. of the sequences would develop. H1N1 virus used small datasets to conduct analysis. tentially affect the current flu-drug binding sites on NA. 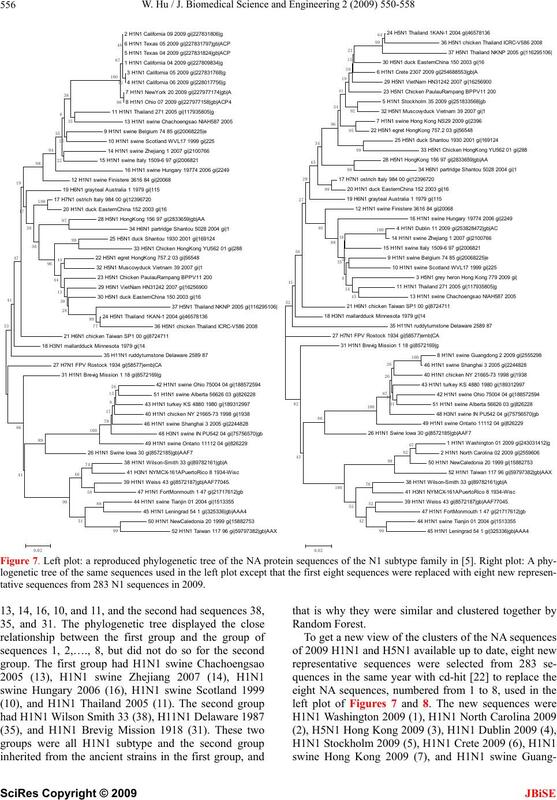 Forest- based clusters of the same NA sequences used in the right plot of Figure 7.
ches of the phylogenetic tree of those in previous years. timely analysis on the 2009 H1N1 virus. Influenza: the mother of all pandemics, Emerg. Infect. Weïwer, M., Chen, C. C., Kemp, M. M., and Linhard, R.
drug and antibody binding sites, Biol. Direct., 4, 18.
physical Research Communications, 386(3), 432–6. formation theory, John Wiley and Sons, NewYork. learning algorithms, Cambridge University Press. 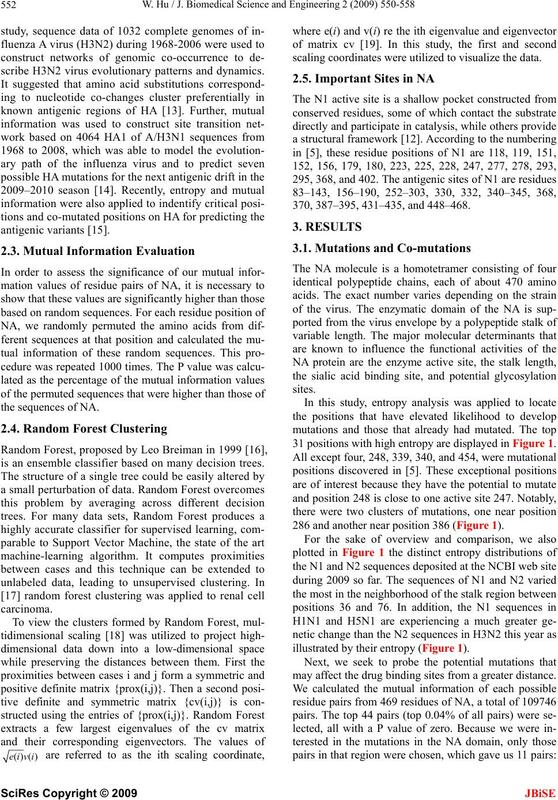 Zhou, H. B., Yu, Z. J., Hu, Y., Tu, J. G., Zou, W., Peng, Y.
sequence alignment, Nucleic. Acids. Res., 33, 511–518. minidase, J. Virol., 67, 2972–2980. A (H3N2) evolution, Genome. Res., 18, 178–187. renal cell carcinoma, Mod. Pathol., 18(4), 547–57. tide sequences, Bioinformatics, 22, 1658–1659.